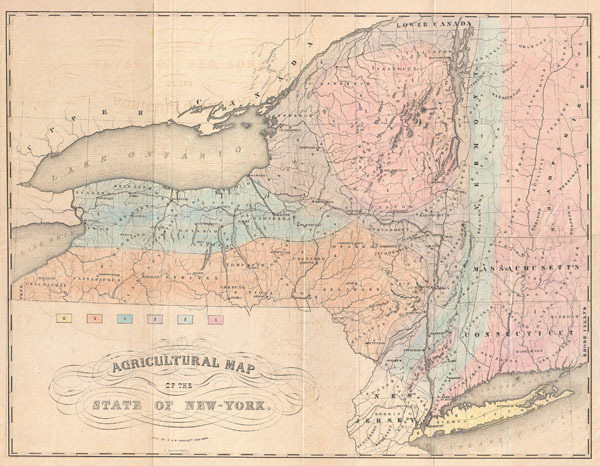 Agricultural Map of the State of New-York. This is a rarely seen 1846 thematic of New York by E. Emmons and G. & W. Endicott. Divides the state of New York, as well as neighboring states of Connecticut, Massachusetts, New Hampshire and Vermont, into six distinct agricultural zones. It is interesting to note that even at this early date Emmons identifies the Adirondacks as an independent agricultural zone clearly definable from other nearby mountain regions. Published in 1846 to illustrated volume one of E. Emmons' Agriculture of New York. Ebenezer Emmons (1799-1863) was an important American Geologist and Medical Doctor. Emmons is considered by some to be a founding father of American Geology. His work was crucial in developing a nomenclature and context for American geology as distinct from European geology. A graduate of Williams College, Ebenezer studied medicine and, as a secondary focus, geology. After graduate he set up a medical practice in Chester, Massachusetts, but never truly abandoned his love for geology. Inspired by the work of Amos Eaton, Emmons enrolled at Rensselear School (Rensselear Polytechnic), where Amos taught, to further his geological studies. After graduating, Emmons wrote several important geological treatises, textbooks, and essays. In the process he is said to have named both the Adirondacks and the Taconic Mountains. One interesting episode in Emmons life was his dispute with James Hall. At the time Emmons was chief of the New York State Geological Survey. Emmons and Hall had a very public disagreement over the dating of the Taconic Orogeny. Emmons believed that the event dated to the Cambrian age while Hall contended with the orthodoxy that the Orogeny was Ordovician. Though ultimately proven correct, the dispute resulted in a court hearing in Halls favor. Emmons was prohibited from practicing Geology in New York State. Instead he became the First Geologist of North Carolina where he lived out the remainder of his days. Emmons, E., Agriculture of New York comprising an Account of the Classification Composition and Distribution of the Soils and Rocks and the Natural Waters of the different Geological Formations together with a condensed View of the Climate and the Agricultural Productions of the State, Vol 1, 1846 New York edition. Good condition. A few minor verso repairs to margins. Moderate overall toning. Original fold lines. Blank on verso. Bourcier, P. G., History in the Mapping: Four Centuries of Adirondack Cartography : a Catalog of the Exhibition, June 15, 1984-October 15, 1985, page 20.